The distribution and structure of the rocks mapped at the land surface can be extrapolated to elucidate the geological structure at depth. Boreholes can sample the rocks below the surface at discrete locations. GSNI holds records for over 30 000 boreholes but of these only 482 are more than 100 m deep and only 18, mainly oil and gas exploration wells, are deeper than 1000 m.
Geophysical data provide further valuable indirect evidence about the nature of the sub-surface rocks and geological structure. These data are related to particular physical properties of the rocks such as density, magnetic susceptibility, seismic velocity and electrical conductivity. The geophysical data can be interpreted in terms of the sub-surface distribution of the rocks from which they originate although there will never be a single ‘correct’ interpretation. Seismic refraction and seismic reflection surveys yield information about the gross crustal structure and more detailed upper crustal structure, respectively. There are no useful refraction data in Northern Ireland and seismic reflection coverage from petroleum exploration activity is sparse and limited to sedimentary basins. The COOLE refraction line and deep seismic data from the WINCH survey line provide information about crustal structure in Ireland and offshore between Northern Ireland and Scotland respectively. The data cannot be extrapolated along strike into Northern Ireland with any confidence. The main geophysical datasets acquired on a regional scale over Northern Ireland are based on measurements of the earth's gravity and magnetic fields. Observations about the structure and nature of the concealed rocks below Northern Ireland are based largely on the interpretation of regional gravity and aeromagnetic surveys . Gridded data has been used to generate colour and shaded-relief images that ‘convey information on both anomaly amplitude (as colour) and anomaly gradient (as relief) and highlight structural trends, lineaments and textural contrasts not easily discernible on standard contour maps’ . Integrated gravity and magnetic anomaly models give further insight into the geological structure of Northern Ireland. Additional information has been derived from the results of seismic reflection surveys, deep-sounding electromagnetic experiments and local ground magnetometer surveys. The Government of Northern Ireland funded a regional aeromagnetic survey of Northern Ireland, flown in 1959, as part of a UK-wide programme. Data from the survey was manually contoured and an aeromagnetic anomaly map of Northern Ireland produced in 1971 . Later the flight line profiles were digitised, anomalies calculated, gridded and computer-generated images produced (P948098). The first regional gravity survey in Ireland in 1950 included 350 gravity stations in Northern Ireland (P948099). The Bouguer gravity anomaly map produced from these observations revealed the general form of the most significant anomalies in Northern Ireland . Gravity surveys during 1959-60 by the BGS provided a detailed coverage for Northern Ireland. A lake-bottom survey, using an underwater gravity meter, provided coverage for Lough Neagh and led to the publication of a revised gravity map of Northern Ireland . Additional data have subsequently been acquired in Co. Antrim and integrated into the regional dataset. Shaded relief has been added to many images to enhance subtle local gradients in the field values thereby creating a topographic surface that is ‘illuminated’ by a point source with a specific inclination and azimuth, thus generating a shadow effect. Although a single grey scale presentation usually provides the highest resolution of the topographic surface gradients, the addition of colours enhances variations in amplitude of the parameter displayed and gives a more informative picture. This process enhances anomalies orthogonal to the direction of illumination so a range of illumination angles is used to highlight different structural trends. Information on the physical properties of the main rock types found in Northern Ireland is limited, although some systematic results are available from outcrop samples and from geophysical logs in deep boreholes. In Northern Ireland the measured density of sedimentary rocks and of granitic intrusions is less than average while the density of most metamorphic and mafic rocks is higher than average. The density of basalt lava of the Antrim Lava Group (see Mantle plumes, ocean spreading and the North Atlantic Igneous Province, Palaeogene extrusive igneous rocks article) as derived from borehole logs is anomalously low (<2.55Mg/m3) compared to the expected mean value of 2.85Mg/m3. However, this may be explained by the presence of features such as inter-flow weathering zones, fracturing and tuffaceous layers, which will all act to reduce the overall bulk density of the lava pile. A representative value of 2.66Mg/m3 has therefore been used for modelling purposes. The sedimentary rocks also show a wide range of density values, with younger sedimentary rocks in general being less dense than older rocks. These values are dependent on the original lithology and subsequent diagenetic and burial history of the rocks. In general, most magnetic anomalies in Northern Ireland are associated with igneous rocks and, to a lesser extent, with meta-igneous and volcaniclastic rocks. Sedimentary rocks usually have very low magnetic susceptibilities, unless they contain significant amounts of ferromagnetic minerals, and give a low or, if their diamagnetic component is high enough, even a slightly negative response. 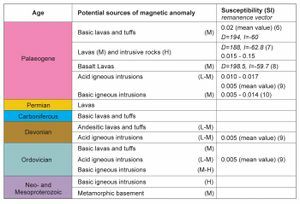 The only systematic examination of the magnetic properties (susceptibility and remanent magnetisation) of rock types in Northern Ireland has concentrated on the palaeomagnetic studies of the basalt lava of the Antrim Lava Group (P948101). The magnetisation of the basalt lava and associated intrusive rocks has been examined in palaeomagnetic studies , , , . Its dominant component is a natural remanent magnetisation (NRM) acquired under the influence of the geomagnetic field at the time of cooling of the lava. The NRM is almost invariably aligned in the opposite direction to that of the present day geomagnetic field. This is consistent with results from other palaeomagnetic studies which revealed that only about 20% of 717 Palaeogene dykes examined in the UK were normally magnetised . The stable bulk magnetisation of the basalt lava is now found to show a declination of about 190° and an inclination of -60°, with variations from the mean of up to 20° in both parameters. In general, for the basalt lavas and minor intrusions, the NRM (acquired during cooling) is expected to exceed the induced magnetisation component (acquired from the present-day geomagnetic field). However, given the variable nature of these properties, the relationship between them, the Koenigsberger ratio (Q), which is defined as the ratio of remanent to induced magnetisation, may be close to 1, or locally <1. 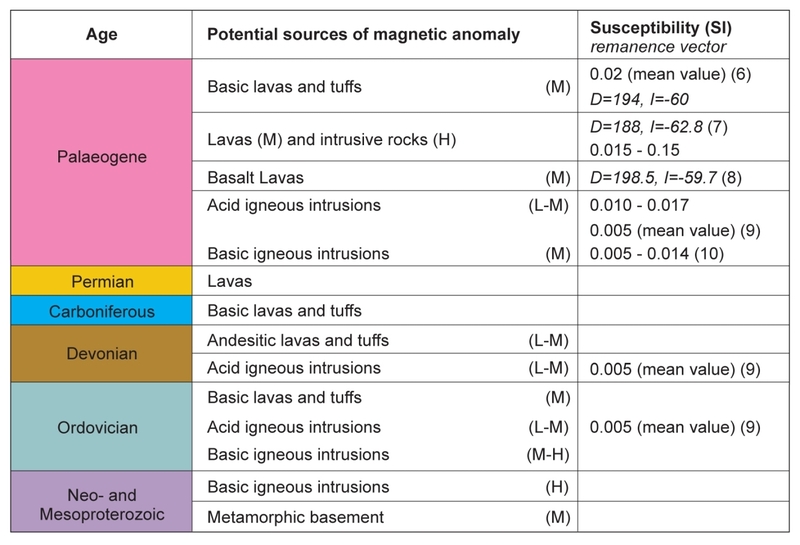 This implies that significant magnetic anomalies may arise from variations in the magnetisation of a lava sequence as well as from variations in the shape and thickness of the lava pile. In addition to the basalt lavas and associated rocks, there is clear evidence of other rock types in Northern Ireland with distinctive magnetic signatures based on an interpretation of the magnetic anomaly maps and the surface geology. ↑ Carruthers, R M, Beamish, D, Heaven, R E, Legg, I C, Mitchell, W I, Reay, D M, and Walker, A S D. 1999. Regional interpretation of gravity and aeromagnetic data from Northern Ireland. GSNI Technical Report 99/1. ↑ Lee, M K, Pharaoh, T C, and Soper, N J. 1990. Structural trends in central Britain from images of gravity and aeromagnetic fields. Journal of the Geological Society, London, 147, 241–58. ↑ Geological Survey of Northern Ireland. 1971. Magnetic anomaly map of Northern Ireland. 1:253 440. (Southampton: Ordnance Survey for Geological Survey of Northern Ireland.). ↑ Cook, A H, and Murphy, T. 1952. Measurements of gravity in Ireland. Gravity Survey north of the line Sligo-Dundalk. Geophysical Memoirs No. 2, Part 4, Dublin Institute of Advanced Studies. ↑ Geological Survey of Northern Ireland. 1984. Bouguer gravity anomaly map of Northern Ireland. 1:250 000. (Southampton: Ordnance Survey for Geological Survey of Northern Ireland.). ↑ Hospers, J, and Charlesworth, H A K. 1954. The natural remanent magnetization of the Lower Basalts of Northern Ireland. Monthly Notices of the Royal Astronomical Society, Geophysical Supplement, 7, 32–43. ↑ Wilson, R L. 1959. Remanent magnetism of late Secondary and early Tertiary British rocks. Philosophical Magazine, Vol. 4, 750–55. ↑ Wilson, R L. 1959. Palaeomagnetism in Northern Ireland. Part I: The thermal demagnetization of natural magnetic moments in rocks. Geophysical Journal of the Royal Astronomical Society, 5, 45–58. ↑ Wilson, R L. 1970. Palaeomagnetic stratigraphy of Tertiary lavas from Northern Ireland. Geophysical Journal of the Royal Astronomical Society, 20, 1–9. ↑ Mussett, A E, Dagley, P, and Eckford, M. 1976. The British Tertiary Province: Palaeomagnetism and ages of dykes, Lundy Island, Bristol Channel. Geophysical Journal of the Royal Astronomical Society, 31, 505–13.